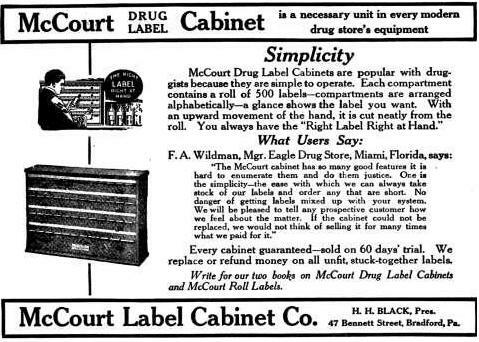 McCourt Label had its start as a manufacturer of label dispensing cabinets for drug stores that was invented by Newton W. McCourt . Mr. McCourt was a man of tireless energy and of an inventive turn who secured his greatest relaxation in working into tangible form the creations of his busy mind. Many of these products attained local fame but with the invention of the McCourt Label Cabinet, the inventor’s position as a contributor of a practical necessity became assured. 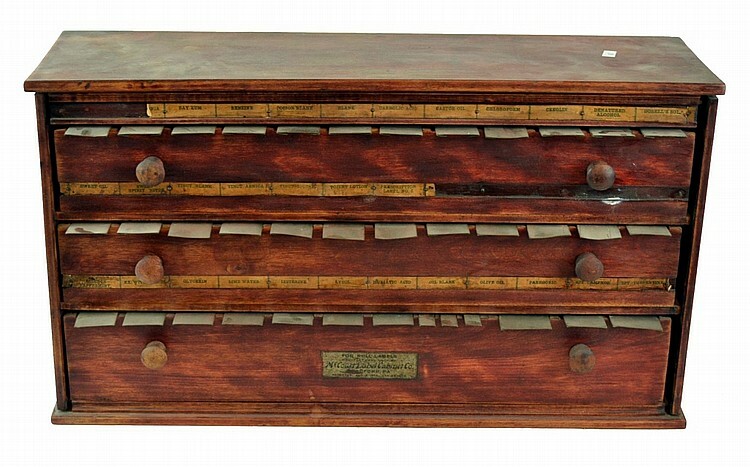 The conception involved not only a cabinet for holding druggist’s or other labels, but the labels themselves, gummed and rolled into compact cylinders. A convenient, cleanly method of keeping labels where they were always available resulted. McCourt’s first home was in the rear of O’Donnell & Flaherty Grocery Store which later was Flaherty’s furniture store. 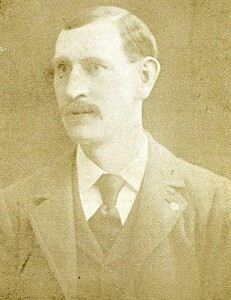 Mr. Flaherty managed the company from 1896 to 1909. The company began operations in 1896 in the back room of the Charles O’Donnell & Matthias F. Flaherty grocery store in Bradford, Pennsylvania. 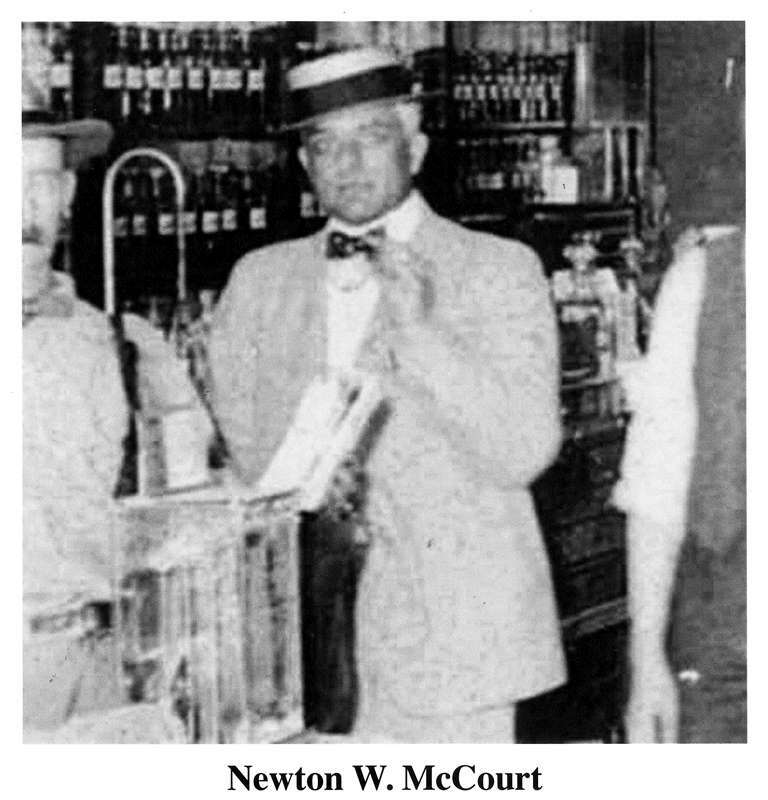 On March 13, 1903, Newton W. McCourt, and George W. McAllister, druggist for McAllister & Skelly, filed a patent for “A Druggist’s Label Holder,” and received U.S. Patent #767,233 on August 9, 1904. N.W. McCourt and G.W. 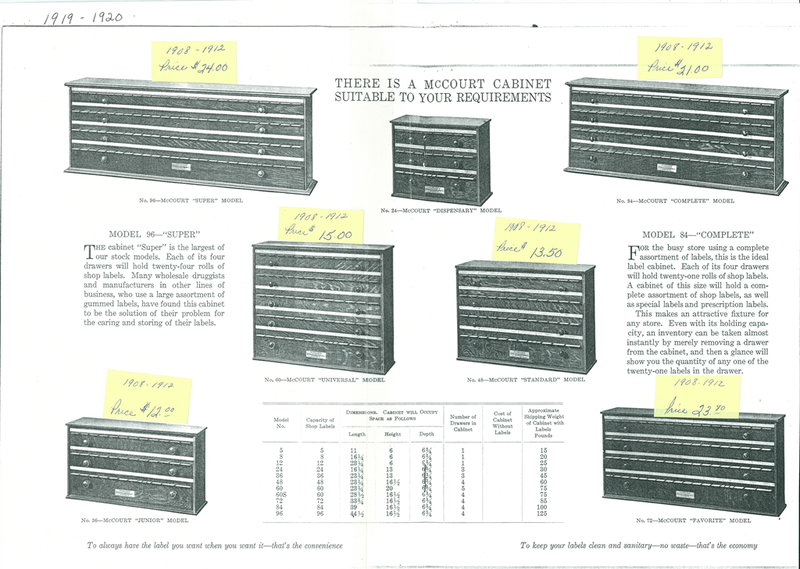 McAllister were paid $4,000 by McCourt Label Cabinet Company to acquire the patent, while N.W. McCourt received shares of stock for all rights to the patent, as well as for the use of his name for the corporation. On August 20, 1904, the company was incorporated under the name “McCourt Label Cabinet Company,” with stockholders: William W. Barnsdall, Jr., an oil and gas producer; Theodore N. Barnsdall, II (son of William), a bookkeeper; N.W. McCourt; G.W. McAllister; M.F. 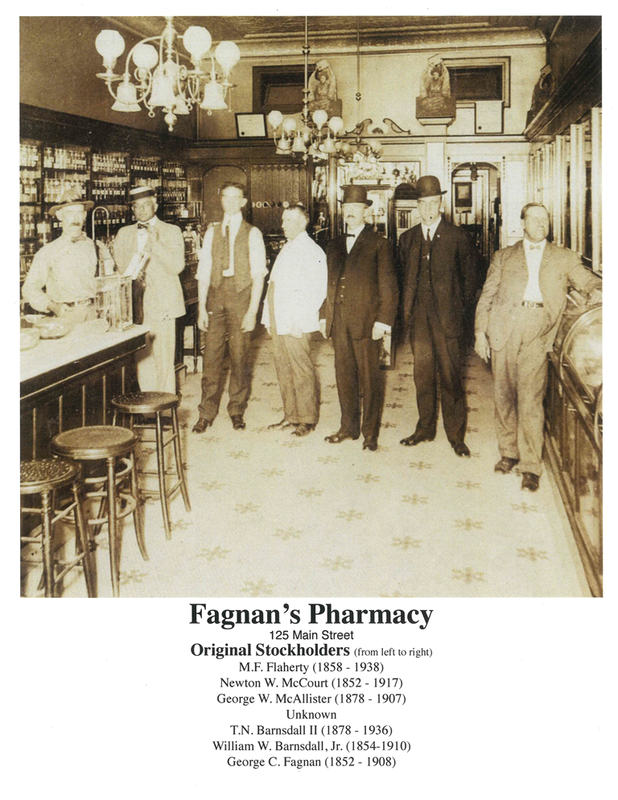 Flaherty (of O’Donnell & Flaherty grocery store); and druggist George C. Fagnan, a former mayor of Bradford. McCourt Label, the first company of its kind in the nation, was managed by M.F. Flaherty from 1896 until 1909. N.W. McCourt and T.N. 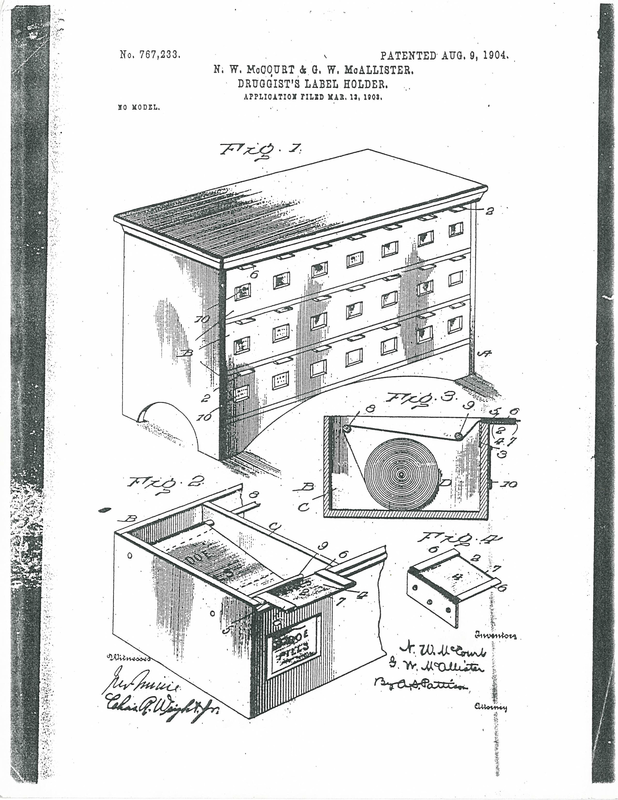 Barnsdall filed patent applications again on Dec. 27, 1904, for “Improvements in Druggists’ Label Holders. 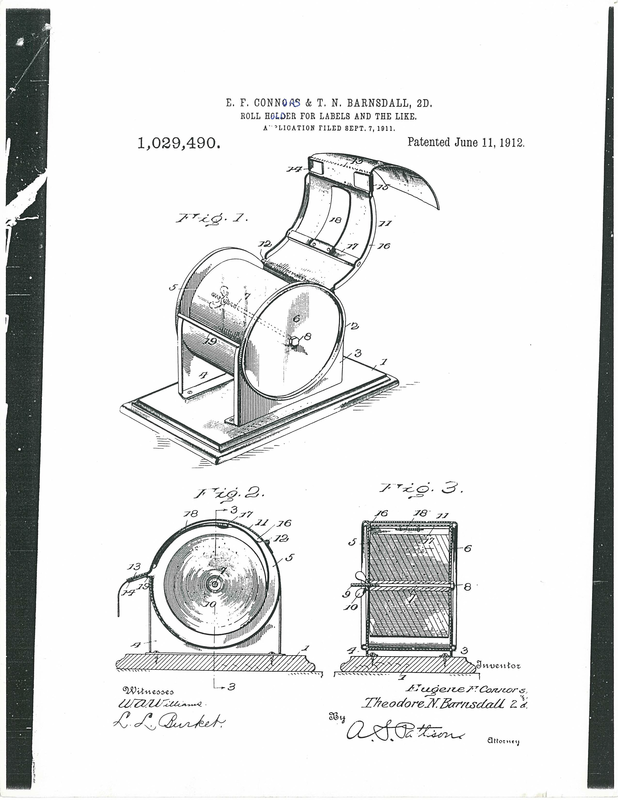 Patent #810,791 was issued on Jan. 23, 1906, and was acquired by the company for $4,000. Unfortunately, G.W. McAllister, who had served as the company’s treasurer, left for another position in 1906 and died March 5, 1907; G.C. Fagnan died in 1908, and W.W. Barnsdall, Jr. died in 1910. Lacking financial direction, the company was nearly taken over by its creditors. 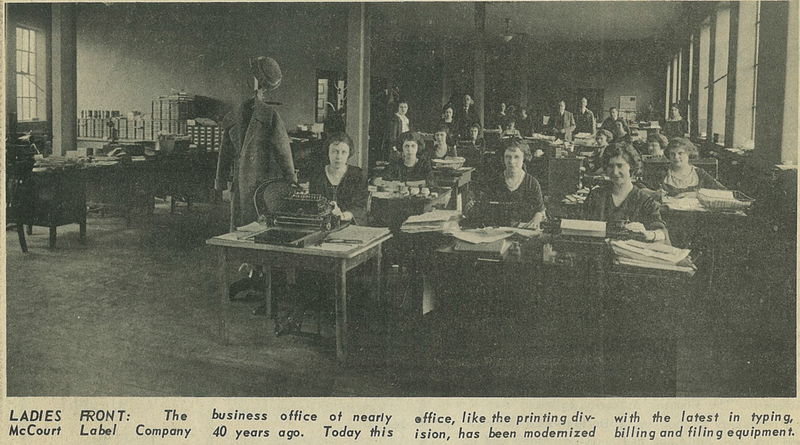 On April 10,1911, bookkeeper Herbert H. Black was sent to inventory the company. After examining McCourt’s situation, Black returned to the creditors and said he would like to try to put the company back on its feet with a new group of investors. 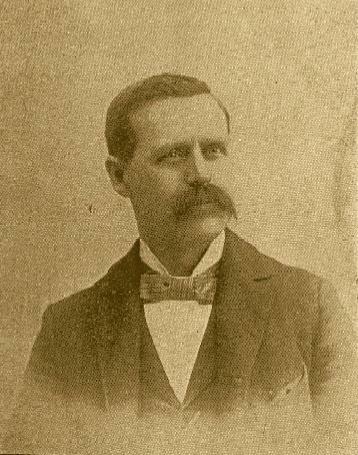 George C. Fagnan, Mayor of Bradford in 1896 and one of McCourt’s original Stockholders. Mr. Black was President of McCourt Label for 47 years from 1911 until 1958. In 1912, H.H. Black was installed as president of the company, a position he would hold for 47 years. 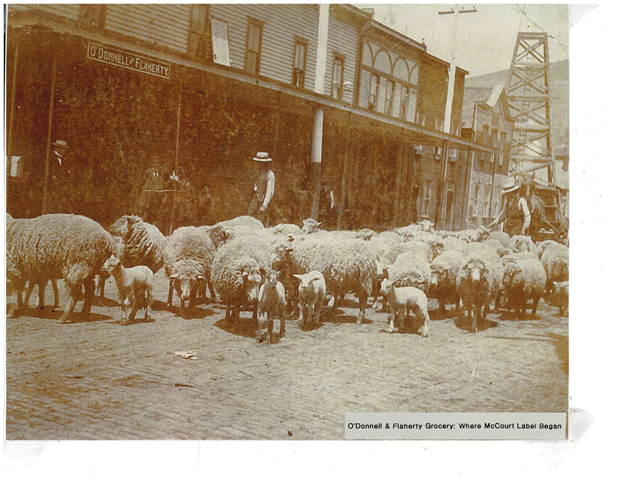 Also in 1912, N.W. McCourt, who had become the company’s treasurer when McAllister left the area in 1906, left Bradford with his wife to resettle in Houston, Texas. The company flourished under Black’s leadership. 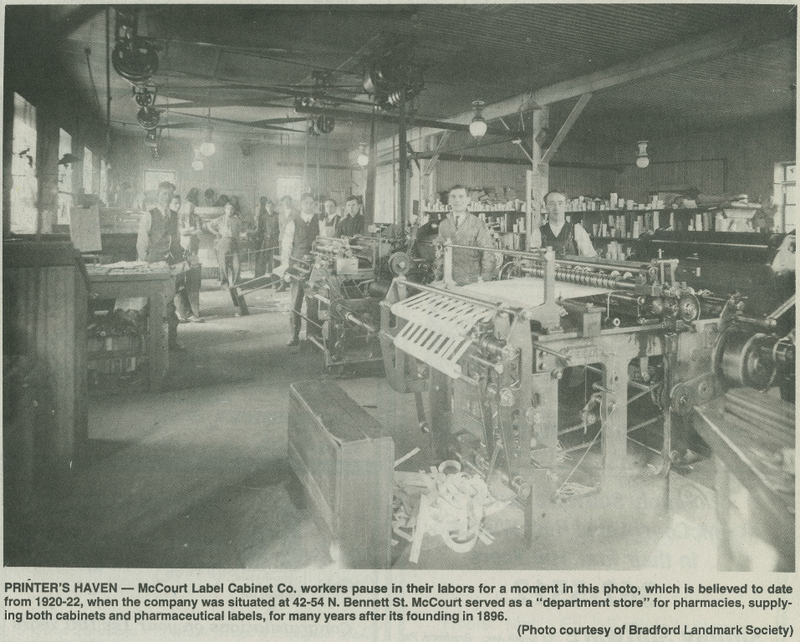 In the early 1920s, McCourt’s manufacturing operations expanded into a larger facility, and the company became established as a nationwide supplier of labels for pharmacies. Isadore I. Rogalsky, who had joined the company in 1920 after serving in World War I, assumed the presidency upon H.H. Black’s death in 1959. A short time later, Jane Fox Black, H.H. Black’s widow, passed away, leaving her company stock to her nephew, John L. Egbert. Egbert was then appointed to the board of directors. 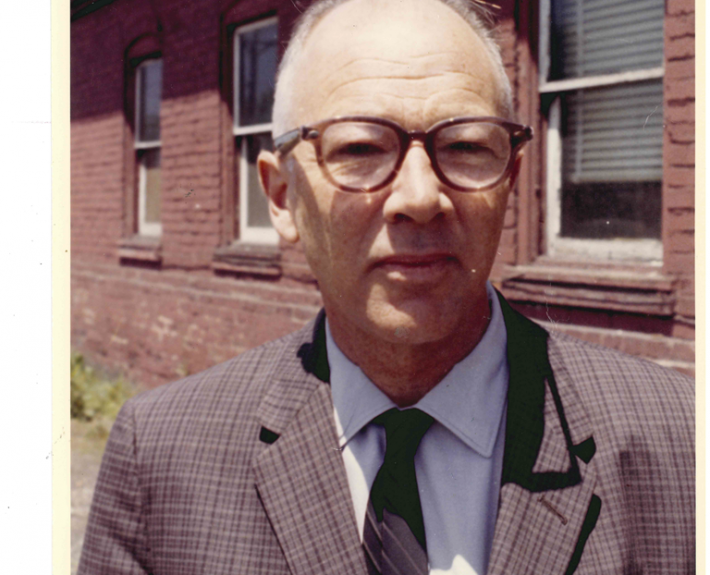 After Rogalsky retired in 1962, Egbert became company president. 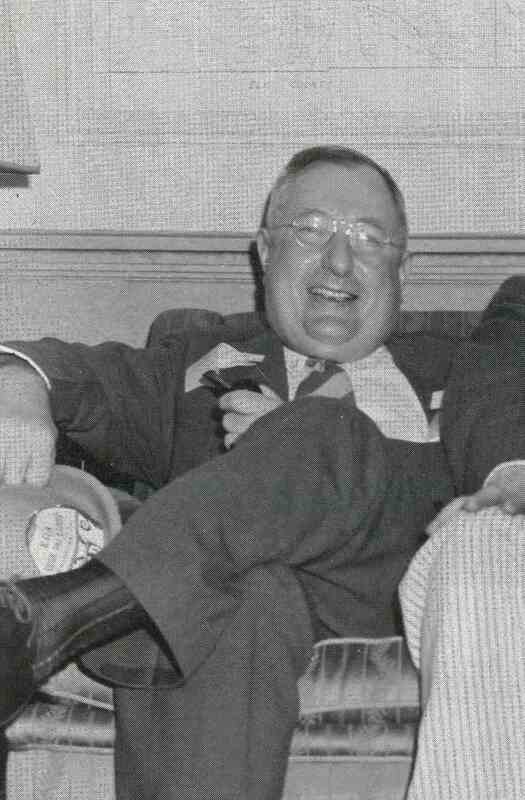 Mr Egbert was the nephew of Herbert H. and Jane Fox Black and inherited their shares of McCourt in 1962 becoming the principal owner. 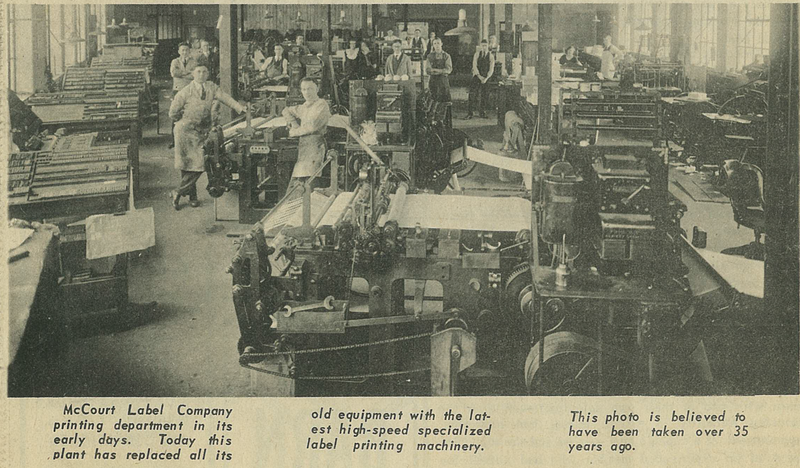 McCourt began to explore the flexographic process for printing in 1967, and took delivery of a 4” Webtron flexo press with four color stations and three die cutting units. This press put the company into the pressure sensitive label business. By 1972, the company had purchased its third Webtron press and had installed a DuPont narrow web photopolymer plate maker. The advent of computerization allowed for expansion of McCourt’s marketing focus. The company became a member of The National Business Forms Association in 1978. Procurement of a 16” four-color Mark Andy flexographic press in 1980 anchored McCourt in the data processing label market. With new growth came relocation of the company’s sales, administration and production operations to its current facility in Lewis Run, Pennsylvania. Today, approximately 75 employees occupy the 43,000 square foot, modern facility nestled in a rural Allegheny Mountain village. McCourt Label Company has evolved to become a high-quality converter of pressure sensitive label products.